Climate impacts are already killing people and destroying ecosystems. Every new climate-damaging project you approve puts us all in even greater peril and makes recovery even harder. You are failing in your duty of care if you encourage or allow new projects that increase the risk of disastrous climate impacts. It is madness for us to allow governments to get away with putting us at risk. We deserve better. As a first step, this ‘no more bad investment’ legislation should ban all new coal, oil, and gas projects within Queensland. No new coal mines. No new CSG projects. No new fossil fuel infrastructure projects. The resultant market certainty would mean solar and wind energy, grid-level renewable energy storage projects, and energy efficiency programs would rush to meet demand with little or no financial incentive from government. Similarly, innovations in all the other climate-damaging sectors of the economy will emerge once there is legislative certainty. There is no need to put our people and ecosystems at greater risk by allowing new investment in climate-damaging projects. We can power our state without sacrificing our future. 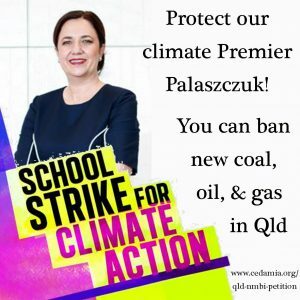 Please sign this petition regardless of whether you live in Queensland or not. Anything the Queensland government does that affects climate will affect everyone in all parts of Australia, and indeed anywhere in the world. 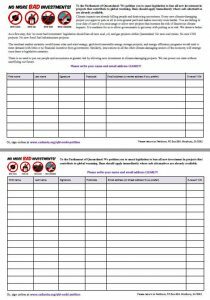 See the Qld NMBI Action Kit if you’d like to help build community and political support for adopting No More Bad Investments (NMBI) legislation in Queensland. See the Qld NMBI Talking Points for points to raise with your local state MP. This petition to the Queensland state parliament focuses on just one component of the Climate Emergency Declaration and Mobilisation program called for in our petition to all levels of government in Australia. State governments have the power to ban specific types of projects within their own state, so successful campaigns to have state/territory governments ban climate-damaging projects would achieve one of the aims of the nation-wide climate emergency mobilisation campaign.